How Would It To Feel Find A Win-Win Solution To Meet Your Goal, While At The Same Time Keeping On Good Terms With All Participants? If this is something you want, then this book is for you because it will show you how to just that and provide many examples of how people win negotiations, while preserving relationships. The ability to effectively negotiate is one of the most powerful skills a person can have. It is a skill that allows people to see things from your side, understand your point of view, and give you what you desire. - How To Get People To Say Excitedly Say "Yes!" - Ways To Create A "Winning Perspective"
4.0 out of 5 starsSome useful information. This book concentrates on communication and the various communication skill that one needs and must have. It talks about negotiation in particular and how to go about it negotiation. 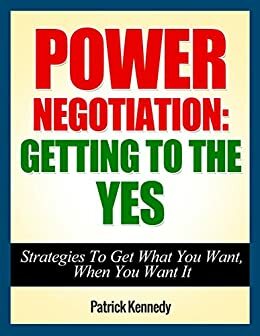 In the negotiation process to get what you want is very important and this book will give you some great tips on how to get there. It covers the subject of negotiation in deep. 5.0 out of 5 starsTo say Yes! A good communicator will surely be a good negotiator. The power of communication is strong to commit success most especially in business. This are all proven strategies and very effective. I am positive of the book and I will share this to my fellow business man. Useful and great strategies! I needed this. I tend to not keep going before getting the yes. The reason why I enjoyed reading the book is because the author went straight to the point, I would recommend it to any person that would like to improve their negotiation skills.